WE BELIEVE THAT DISABILITY IS NO BARRIER TO MAKING MUSIC. Participatory creative music sessions for people with disabilities/additional support needs working in partnership with your organisation. We run weekly workshops in our fully-equipped own studios in Newry, Belfast and Derry for both individuals and groups. For people experiencing early to medium dementia. We offer group workshops. 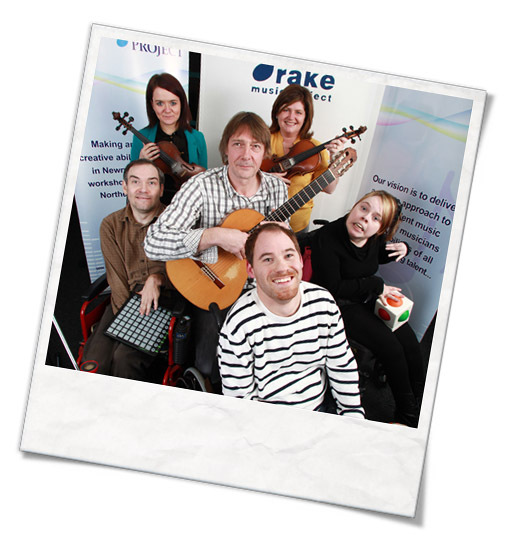 The Drake Music Project, Northern Ireland exists to afford physically disabled adults and children, and those with learning difficulties the opportunity to independently compose and perform their own music using technology. Workshops in composition and performance skills are delivered using a combination of a range of computer interfacing technology and musical instruments regardless of ability – Students only need to want to be involved! Our studios are located in both Belfast, Newry and Derry and the team delivers workshops all over Northern Ireland, not only teaching the students but also designing and adapting interfaces depending on each individuals requirements ensuring maximum accessibility for all. Contact us to find out more about mobile studios.